I've seen this book at the library and wanted to read it for a while. 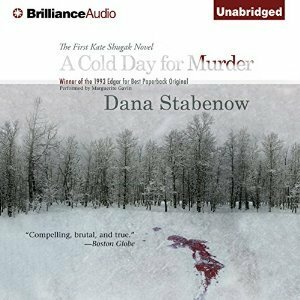 When Audible featured it as a Daily Deal, I couldn't resist buying it. However, the book left me a bit underwhelmed. Let's start with the pluses! I actually love the main character, Kate Shugak. The reason why she retired from the District Attorney's office is because she was involved in a knife fight with a child molester (he lost) and she was injured. She had the highest conviction rate of anyone in the DA's office, and the FBI tried to recruit her. Kate is tough as nails, and she is perfectly happy living on her remote and isolated homestead in barren Alaska. Kate's former flame and boss, Jack Morgan, pays her a visit and pleads for her help in locating the national park's ranger who has mysteriously disappeared. Jack also has a FBI agent in tow, because the ranger's father is a congressman from Ohio. The investigator that Jack sent to look for the ranger has now disappeared as well. Kate agrees to help out, but she is going to wish that she hadn't! I thought that this was going to be more of a cat and mouse type of book, with Kate trying to stay one step ahead (or annihilate) the bad guys. She seems the perfect heroine to do that, but it wasn't that type of book. For the first third of the book, Kate was preparing for her search. Finally, when the search started, it was just a lot of talking and very little action. The pace of the story was very slow, and I actually found it to be a bit boring. It won the 1993 Edgar Award, so perhaps I am in the minority. Even so, I do think this series has potential, and there are 21 books published so far. I do love Kate as well as the Alaskan setting, so I am willing to give this series another chance and will continue with the next book in the series, A Fatal Thaw. This book was narrated by Marguerite Gavin, and she did a fine job but I felt that her voice didn't quite match the main character. Stabenow describes how Kate was slashed across her throat from ear to ear and how the injury damaged her voice and left her with a nasty scar. As a result, I expected Kate to sound more hoarse or gruff. Even still, I am glad that I listened over reading because listening makes it easier to get through a slow story.